Feel free to post your enclosures here or ideas for how to improve this one. I invite posts with new ideas as well as constructive criticism since, done in the right spirit, makes everything better. 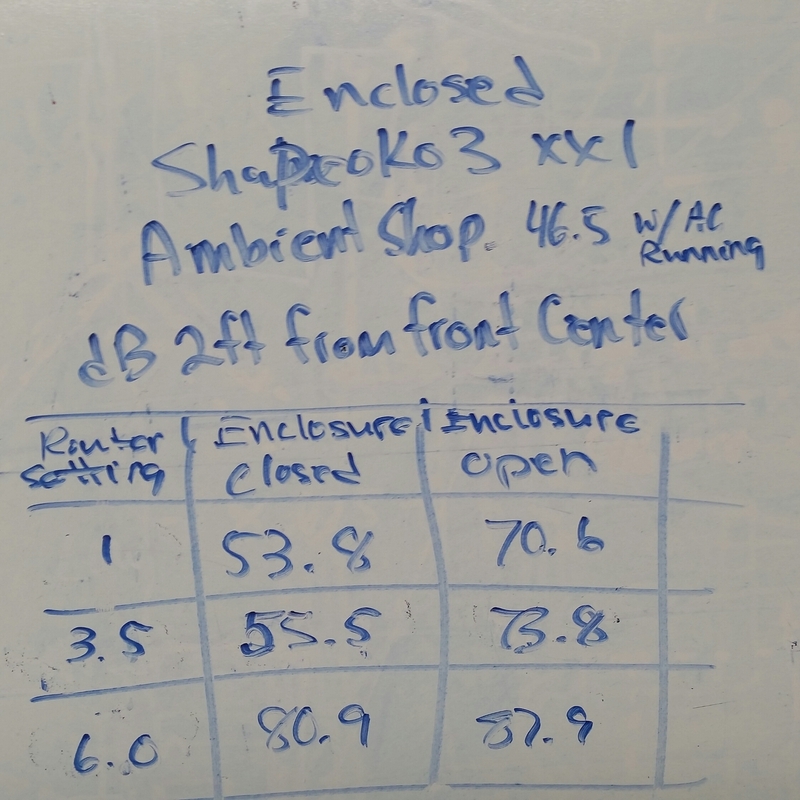 Router speed vs potentiometer resistance (tests ran to determine what potentiometer to buy to add a remote speed control to the enclosure control panel). I have another thread somewhere on the C3D forum showing how to rewire the Dewalt DWP611 router to control the speed and light independently and remotely. SO3 XXL: Share your Workspaces! Lighting? Sound suppression materials? Windows? Sealing? I used acoustical damping caulk at all the joints and I’ll have vibe isolation between the feet of the SO3 and the base so that should take care of most of the higher frequency noise. If its still not enough then I may add some mass to the inside of the panels. When I get the vacuum installed that will take care of it not leaking. I don’t want it sealed too well or it will implode. The DeWalt router has lights built in and I have a lot of light in the shop. Do you think I may need more? I find that it is nice to have some LED bars in the enclosure for ambient lighting. Choose you spectrum (I like cool white - 6000K). YMMV. How about a handle or handles? I seal my enclosures to death, then add ports for air intake. This avoid any potential “whistling”. The ports can be simple holes or fancy diverted manifolds (trivial to do) so that any noise escaping is reduced. You may have the Dirichlet problem with the larger sides - drums. If so, mass is good but finding the frequency and cross bracing can cancel couplings and resonances more easily. Check out WhisperMat. Low density foam over high density foam. Really kills vibration and sound. I use 3M Super 77 adhesive to bond the foam to the enclosure walls. Some prefer to screw it on. YMMV. I have a lot of finishing to do like legs, trim, handle(s), closers, etc… I think I would like to make at least one of the parts on the cabinet with the SO3. It just seems fitting. I’m thinking about making two parts that look like a fancy turned rod but are really two one sided milled pieces glued together to look like a turning. Thanks for the WhisperMat info. I wish I would have known about that stuff a long time ago. I’ve spend many hours trying to find products to reduce sound emissions without getting too expensive or complicated. I made some low frequency vibe isolating feet for my nomad (combination of a 3D printed part and very low durometer silicone) that seem to really work well. I’m going to try a version here too. They pretty much attenuate conducted vibration over 15 Hz or so to nearly nothing. They pretty much attenuate conducted vibration over 15 Hz or so to nearly nothing. I’m mostly worried about the 20-400 Hz overtones/harmonics that seem to find the coupling/resonance with the walls and/or floor. Things may sound good now, but see what different jobs do. I think I would like to make at least one of the parts on the cabinet with the SO3. Rightfully so. I made some brackets for my enclosures. Happy to provide useful details! It’s sold 54" wide so a few square feet of goes a long was for small enclosures. When possible for for the 2 pound stuff. Nice enclosures have a “show off” value (one reason I suggest ambient lighting). Do consider a nice finish for the wood, perhaps a light stain sealer. YMMV. I may never put a finish on it. I don’t really care that much about how it looks. I’m a function over form kind of guy, 99% of the time. 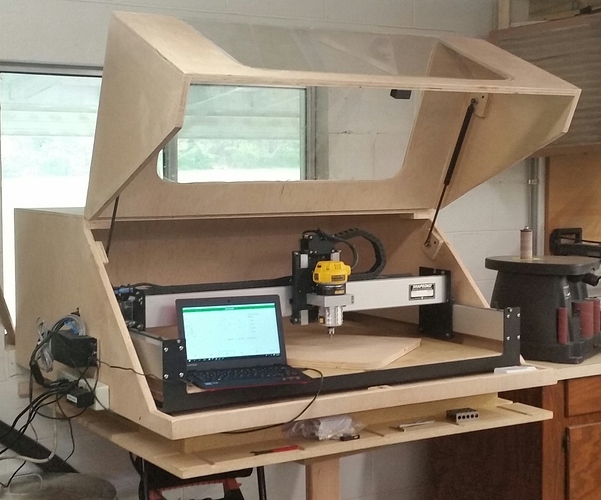 I’m a little bit more finished than you (many people say I have an “industrial vibe”) but nowhere near what my friend Tim did (he’s just finishing up now; took over a year, his CNC machine sitting there). He built his enclosure as FURNITURE with FURNITURE QUALITY. Real 2x4. Hardwood ones. Hardwood plywood (all layers). Screws. Seals on doors. Fine, multilayer finish - stain and sealer. He designed custom dual pain windows (better sound suppression), diverter manifolds for the inlet ports, custom fittings for cable entry, custom LED spot lights (dimmable, of course), custom hard side ducting, custom dust head and attachments. The list just goes on. It is so total overkill in my book… but it is gorgeous! He had so much fun building it I couldn’t tell him to stop. I bought some sealing strip but after thinking about it more I probably won’t use it. I may add an overlap so when the door closes it will overlap a thin panel all around. Maybe, maybe not. I’m much more interested in attenuating sound so I’ll do what I need to do to maximize sound attenuation. Just trying to be complete. Depending on how things seat, a far amount of noise can get by the door, hence asking about seals. I’m much more interested in attenuating sound so I’ll do what I need to do to maximize sound attenuation. Definitely where I would go next. Run some jobs to get a range of frequencies - different RPMs too - and listen. I use a neat app on my phone for a pretty good approximation of a spectrum analyzer. Does your electronics enclosure fit inside? Or did you mount it somewhere else? I could mount it high inside but I’m going to mount it outside so it’s out of the dust and the power and USB are easy to access. I always mount my electronics outside… dust gets everywhere! Builds up in power supplies and causes early failure and other problems. If you like making stuff… check out some of my other gadgets on my YouTube channel and subscribe if you like. 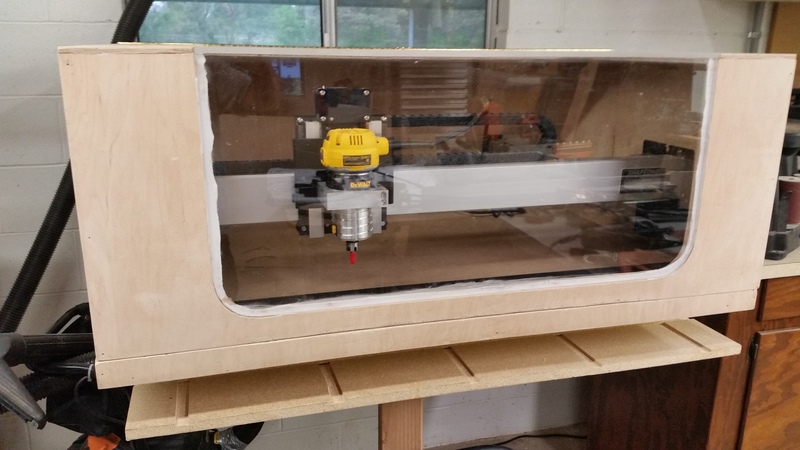 I’ll also be posting more updates there regarding the Shapeoko3 XXL enclosure as it progresses. Very nice. Thinking about building something similar, except mounted to my folding table I’ve built while I wait for my XXL to arrive. 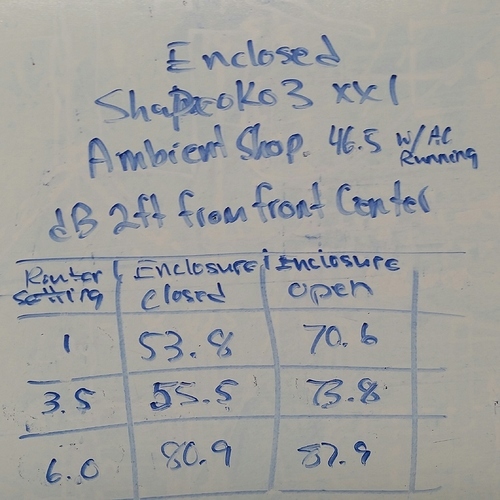 Any idea what the minimum height of the enclosure needs to be? Think about a big sheet of stock. What makes it easy to load on the top of a table or the bed? Measure yourself. Set the enclosure height such that the bed is at the easily load stock. I like the folding table designs that I’ve seen. Nice work. I don’t really have a good place to do it in my shop but I don’t see why you couldn’t just mount the router to the wall if the y axis counterbalance is added. Really it should work just fine since you have to secure your work piece anyway. It would make the enclosure easier since you would just make a cabinet with a big door. Trying to visualize what you’re saying…but I can’t. 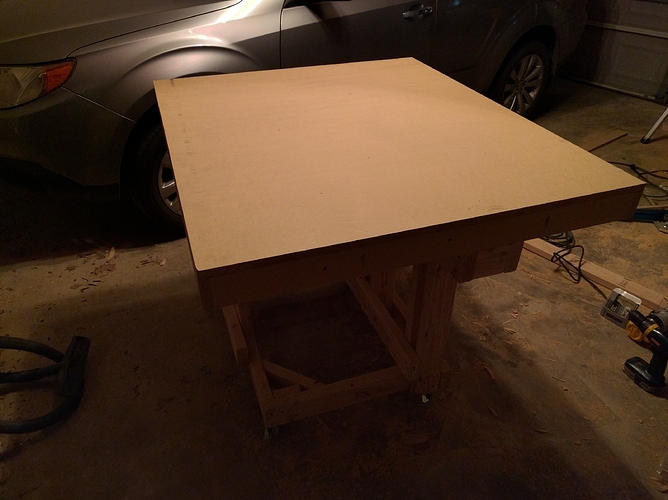 I have this on casters, as my garage is pretty small, so I want to be able to pull out the car and pull the XXL into the middle of the garage. 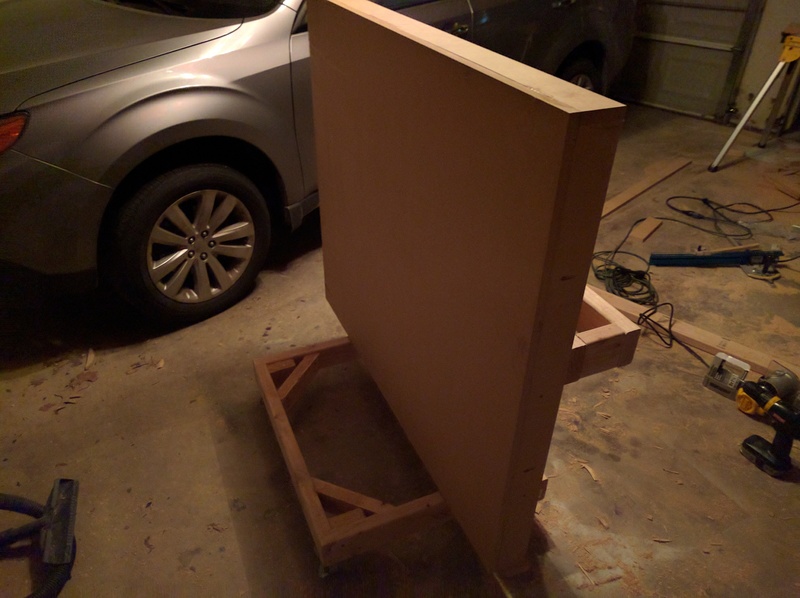 I had thought about building the folding table attached to the wall, but I was afraid of vibrations making their way into the walls and resonating throughout my house. That’d be terrible. Your folding table will work great. My idea is more of an “out of the box” kind of thing. 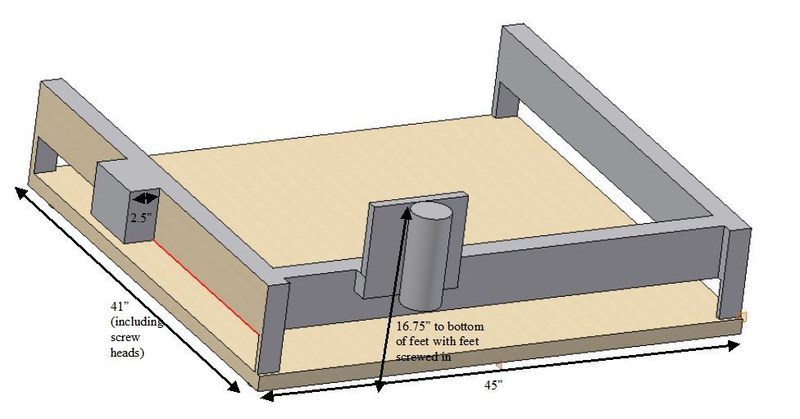 I’m talking about physically mounting the machine to the wall or from the ceiling with the table on a plane parallel to the wall and adding counterweights or counterforce springs to compensate for the weight of the components carried by the X axis motors. If you suspended it from the ceiling via springs or bungees the vibration transmitted to the house would be near zero. Its an out of the box idea but I’m sure someone has had to have done this by now. Maybe I’m missing some major disadvantage but, with just a little thought given to the idea, I can only think of several significant advantages.